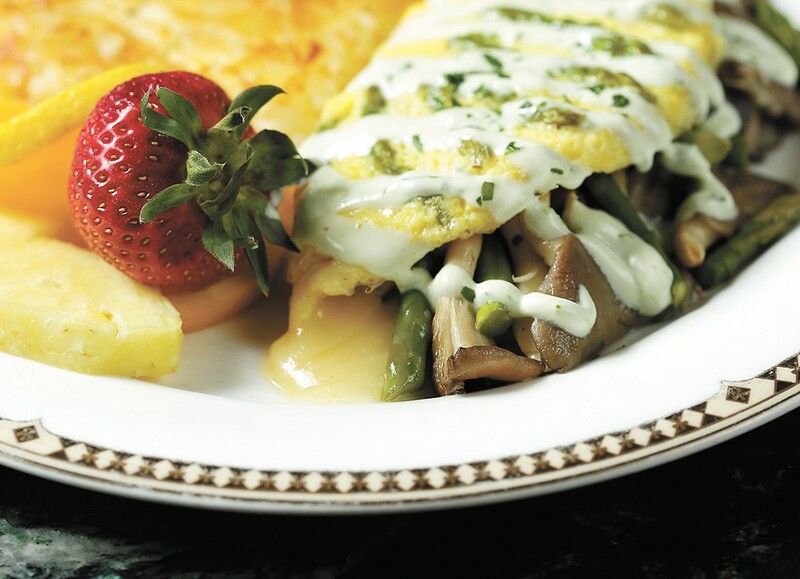 A forest mushroom and asparagus omelet from the Palm Court Grill. Wild mushroom season can come and go quicker than a summer storm... or never come at all, making last year's can't-fail foraging spot a total bust. Sometimes, local chefs have to rely on the most intrepid hunters willing to scale nearly vertical alpine regions, made snot-slick from last year's forest fires, for morels in the spring, or hunch-walk for hours scouring the lowlands for chanterelles in the fall. These challenges make for more mushrooms appearing on local fresh sheets than on standard menus, so check to see if spots like Central Food or Latah Bistro in Spokane, both of which serve mushroom-heavy pastas, substitute local wild mushrooms once they come into season. In the spring, look for well-known regional mushrooms like the otherworldly morel, but also for the firm bolete, which stands up well to soups or curry dishes. A pain to clean but delicate in appearance and flavor, feathery coral mushrooms might be stir-fried to top a salad. Come fall, golden chanterelles require little more than sautéing to release their liquor — mushrooms are typically around 90 percent water — and unmistakably earthy aroma. Also look for mushrooms that are poached, pickled, doused in flour and deep-fried, or dried for use in soups, stews, sauces and other dishes, especially when mushroom season — already elusive — has long passed. And certainly, consider the following local menu offerings, featuring sometimes-wild, sometimes-cultivated mushrooms. The delicate flavor of mushroom pairs beautifully with many egg dishes, including omelets, which the Davenport's Palm Court Grill serves with asparagus, Swiss cheese and chive cream sauce. Chef Adam Swedberg uses three types of mushrooms — oyster, cremini and portabella (technically, cremini and portabella are the same mushroom, just at different stages of development). Although he loves to use local and seasonal ingredients, Swedberg says the challenge he faces is the same as many chefs: local mushrooms are only available at select times of the year. Instead, look for seasonal, local mushrooms like chanterelles and morels in the Palm Court Grill's fresh sheet offerings. Hill's Resort, a favorite North Idaho getaway for more than 70 years, is still run by the family who founded it in 1946. Older still are the forests surrounding the resort, which sits on the lower west side of Priest Lake. In those forests grow morel mushrooms, which form the basis of a rich cream sauce for the house favorite Chicken & Morel Linguini. "Our chefs prepare each dish to order, so the morel cream sauce is made from scratch each time the dish is ordered," says resort food and beverage manager Whitney Hill. Not one to keep a good thing to themselves, the Hill family shares several recipes for morels and huckleberries — two items the region is known for — on their website (hillsresort.com). "I love the black trumpet because of the crunchy texture, and the fact that it is the only mushroom I was lucky to pick in abundance in the region I grew up (near Alsace) with my dad."